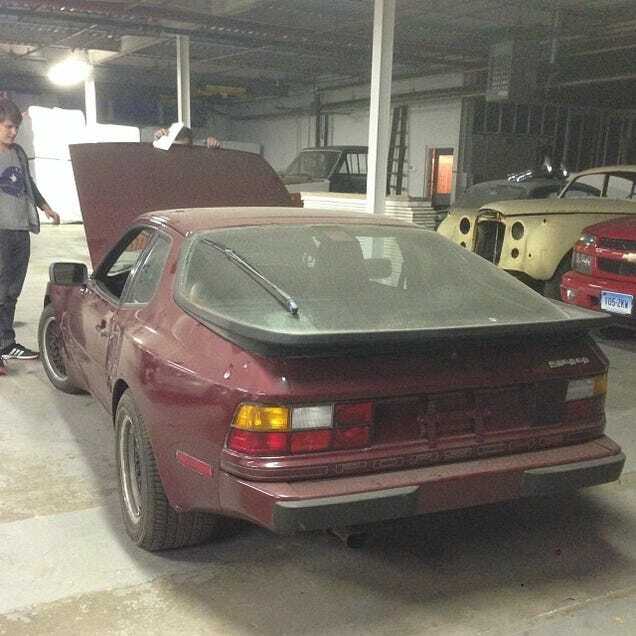 After I blew up my Porsche 944, I was left without a running car for nearly two months. As an eighteen year old living in New York City, I had no need for a car. I was working a full time job and was lucky enough to have been able to have my father drop me off and pick me up from work, in the luxury of his 2015 Subaru WRX. But, winter was rapidly approaching. This meant that ice racing season was rapidly approaching, and I knew I wouldn't be able to survive another winter without a tool for some proper winter hoonage. I scoured Craigslist regularly, my heart was set on either a BMW E30 325ix, an early Subaru 2.5rs, or an early Subaru WRX. Unfortunately, it seemed that due to the ever growing E30 Tax, I wouldn't be able to get solid AWD E30 within my price range. I even consulted with my friend and local E30 expert, Levent at Gutenparts. He reassured me that if there were any remotely good deals on a 325ix, he would've already snatched it up. Knowing that I would probably beat the sh*t out of whatever I ended up buying, he gave me full notice than an E30, especially an all wheel drive E30, might not be the best option for me. When evaluating the markets further, I noticed that early 2.5RS' were just as expensive if not more expensive than some early WRX's. I was attracted to the 2.5RS because I had first hand driving experience in one already and loved the body styling, but I didn't see any reason why I should choose one over a WRX for a lower price. Buying a WRX was a completely different experience from when I bought my Porsche 944. Buying the 944 was easy. Mathias found the car on Craigslist, we looked at it in person, I test drove it to the best of my ability, and after we consulted Oppositelock for approval, I told the lovely New Englander selling the car that I might be back in three days with the cash, to which he responded "Ohh okay, well remember I'm just a hop, skip, and a jump away!". So after double checking my New England translator, I decided to give the seller a ring back and let him know it was the car for me. Then I attempted to drive the car home and it tried to kill me. The WRX on the other hand, I had no real intentions of buying. Sure, Mathias and I set out that day with a dealer plate and the goal of getting me a new car, but that goal wasn't exactly to purchase what appeared to be a twelve year old rust bucket with more miles and less service records than that 2004 Crown Vic that just passed through lane 04 at Manheim Metro Skyline for the third time this month, unsold. At first, I thought I found the perfect car. 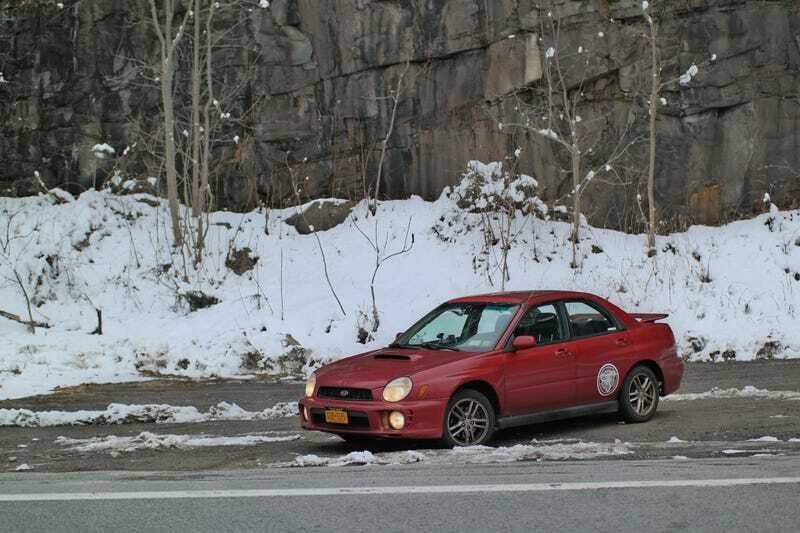 It was a 2002 Subaru Impreza WRX, red, clean, manual, and it was even a hatchback. But it was almost three hundred miles away. Even though we were already in the car ready to venture anywhere I demanded, I couldn't justify making Mathias drive me three hundred miles to look at a car that was more than likely another great example of what twelve years of Vermont road salt can do to a Japanese econobox. I quickly began looking for more accessible alternatives. I lowered my standards and came across another 2002 Subaru WRX, unfortunately this time it was a sedan, but I was open to anything. I sent the seller a text to confirm the car was still available and that he was around to show the car. In response, the buyer used a selling tactic I had not yet encountered in my very little experience of car buying. The car was listed for an optimistic $3500, and in response to my text of 'WRX still available? ', I get "$3000 take it today". Mathias and I grabbed lunch then arranged to see the car. The seller was young, not as young as us of course, but young, and very New Jersey. At first glance this WRX didn't exactly seem like something I would want to drive. It had a cracked windshield, a questionable amount of rust above said windshield, an aftermarket blow off valve, holes in the top of the trunk, decent body damage on the right rear quarter panel, and a very unsettling amount of negative camber from the rear right wheel. Oh and don't let me forget the odometer reading of just about 251,000 miles. But it did have its pros as well. There was no frame rust and barely any of that cliche Subie quarter panel rust. The WRX also had a serious front subframe brace, something I wouldn't have noticed if Mathias weren't inspecting the car with me. It also had a full straight piped exhaust, 3" downpipe, and unequal length headers, delivering that irresistible Subie burble, as well as an incredibly strong feeling motor and turbocharger. When I was offered a test drive in the car, I was stunned by how well the motor pulled. There were other cons though, like that synchro grind into fourth, and the incredibly obvious banging noise from the right rear shock, which the seller tried to play off as the "loose spare parts in the trunk banging around", yeah I don't think so. The seller also made a point to tell us how this car was able to 'take' M5's and stuff in 'races'. That was a red flag. When we returned from the test drive, we gave the car one final lookover and I told the seller I would have to think about it. Afraid that the seller might get even more New Jersey with us, we hurried back to Mathias' ML and took off. We couldn't drive five miles without me being bombarded with texts with lower and lower offer prices for the car from the seller, so Mathias pulled off the road, and we talked it over. It was only the second WRX we had the opportunity to look at, and the first one had a serious case of rod knock. The seller and I settled on a reasonable $2500, I returned to the seller with the money in hand, we signed papers, shook on the deal, and Mathias slapped the ever so convenient dealer plate on, and I took off in my new ride. Follow Aaron's shenanigans through Twitter and Instagram, and no, he doesn't actually have all those followers.